Pretty home. Poor gutter design. Too much roof area flows into too small of a gutter area, creating water overflow. Spring is the time of year when you find out if your gutters are working as intended or are in need of TLC. With spring rains comes the opportunity to check your gutters to make sure they are successfully moving water off your roof and away from your home. Detecting leaves and debris is easy to do and you’ll know this is a problem whenever you see water cascading over the gutters to the ground below. Leaves, twigs or tree saplings growing out of your gutters is a telltale sign that you have neglected your gutters for too long and they need help — stat. Walk around your house when it’s raining and listen for water running down the downspouts. If you hear a trickle rather than a gush, then you know it is time to clean out the gutters. This is also a good time to consider installing a quality gutter guard system to keep your gutters clog-free. Poorly sealed inside miters, outside miters, end caps and rusting galvanized metal all contribute to gutter leaks. Your gutters take a beating from the sun’s UV rays everyday. Gutters get hot during the day and cool at night. Constant temperature swings means that unless your gutter installer used a professional grade construction adhesive that is designed specifically for gutters and metals, you’ll likely experience problems sooner than later. Ultraviolet light can quickly breakdown cheap caulks and odds are your gutters won’t last the test of time and will leak. What starts as a slow drip can become a steady water stream that can be difficult to repair and lead to other issues inside your gutters, in your garden, and around your house. If you own a home with galvanized gutters, the metal needs to be maintained and painted regularly otherwise they will rust through. If your gutters are made from galvanized metal and you see rust spots or holes, it is time to replace them. Whether your gutters are old or new, if not installed properly, they will be ineffective and useless. Improperly hung gutters will lead to water damage around your home, and you will have to eventually pay to have them rehung or replaced. This problem is completely avoidable but is one of the most common reasons why gutters leak. Sadly, few gutter installers use levels to ensure a proper pitch. For some reason, it’s taboo to knowingly install gutters properly. It’s so much easier to guess and just hope for the best! 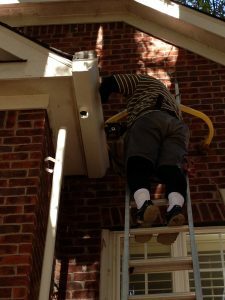 All too often, hiring an installer who refuses to use a level to install your gutters will result in gutters that won’t drain properly, will overflow, and will have to be re-pitched. Water overflowed with 5″ gutters. Upgraded to 7 inch gutters. If your gutters are free of leaves and debris, sealed and hung properly, odds are that they’ll work most of the time. The general exception to this rule is when they are overwhelmed by too much water flowing into too small of a gutter section. For instance, if you have upper gutters that carry water to lower gutters, correctly sizing the lower gutters is important. Most homes have 5” gutters while others have 6”. In some cases 6” is too small and 7” or larger gutters are necessary to effectively carry water away from your home. It is becoming more common for architects and builders of newer homes to choose design over function by ignoring basic water management principles. A recent example was a new 5,500 SF home (pictured above) with a steeply pitched roof of several hundred square feet that drained into two 14” long x 6” wide gutters on either side of a bump out window. While the contractor installed 6″ gutters, there is not a chance that the gutters can adequately handle the water flow. The poor home design left the homeowner few options to successfully address the problem. Believe it not, not all water problems are driven by rain gutters. Roof shingles can contribute, if not be the root cause of water problems. Shingles that hang too far into the gutter or are cut short can cause serious water problems. To illustrate, if shingles hang too far into the gutter, they reduce the amount of area that your gutter has to accept water. Situations where shingles extend into the gutter by 2-3 inches turns a typical 5” gutter into 3” or 2” gutter. In valleys — where two roof surfaces converge — there may be times when water simply washes over and misses the gutters altogether. Conversely, if roof shingles don’t extend far enough past the fascia board, water has an opportunity to wick back under the shingles and run behind the gutters along the fascia boards. This issue causes recurring leaks behind the gutters and is a surefire way to lead to wood-rot of your roof decking, fascia boards and soffits. So if your gutters are clogged, leak, sag; are too small to handle the water flow, or the position of your roof shingles or metal roof are reducing the effectiveness of your gutters, now is the time to take action, call an experienced gutter contractor (see Stop: Don’t hire a gutter contractor until you ask these 5 critical questions), and get your water problems resolved immediately. Properly addressing these issues will help you successfully move water away from your home while minimizing water damage to wood surfaces and exterior walls, while stopping water leaks in crawlspaces and basements; reducing landscaping washouts and more. If you are experiencing any of these issues and need help, feel free to reach out to us by calling Gutter Guards Direct toll-free at 1-800-750-2131 or emailing info@gutterguardsdirect.com.